Jonas Bjerre-Poulsen and Kasper Rønn founded Norm Architects, a multidisciplinary design studio, in 2008. Bjerre-Poulsen and Rønn decided on the name “Norm” because they work within the traditions and norms of Danish design, while refining them to create something new. The studio works with residential architecture, commercial interiors, industrial design, photography, graphics, and art direction. Norm Architects has joined the Menu brand—a renowned Scandinavian design company—as art directors, curating furniture and lighting collections and launching their own collections within the brand. The Norm Dinnerware Collection was designed in 2010 when Menu and Norm Architects began a collaboration with Copenhagen restaurateurs Cofoco to create tableware products that expressed a Nordic sensibility for the new restaurant Höst. The result is a clash of urban modernity and simple rusticity, a collection with a color palette that recalls crisp Nordic winds. 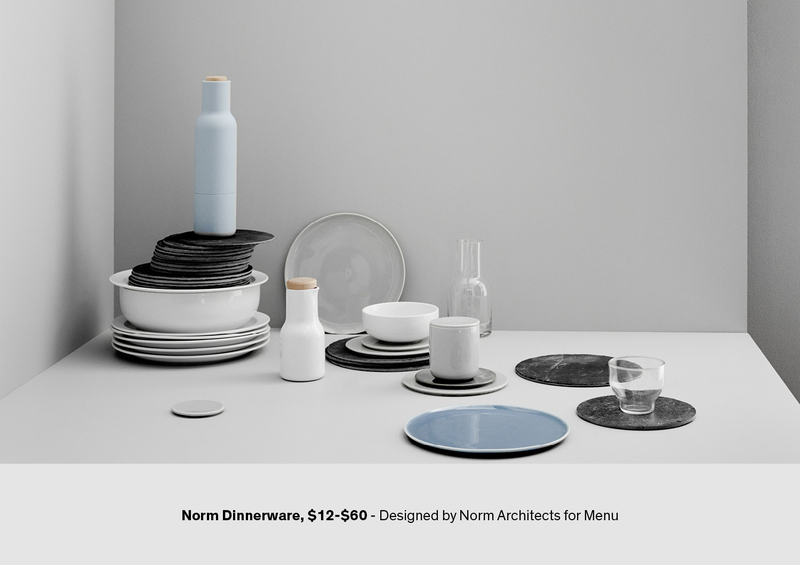 The new Norm Collection, along with the restaurant itself—also designed by Norm Architects—calls to the Danish countryside and modern Copenhagen, in the cool colors and simple silhouettes created by each product. Norm Architects designed the structural space of Höst, alongside the dining tables, curtains, dinnerware, glassware, and even the pendant light fixtures. The result is a truly cohesive space that captures exactly what Norm Architects strive for in its name—to honor the traditions and norms of Scandinavian design while breathing newness into each piece. The items designed for Höst are simple and timeless, and are meant to be used everyday. Each dish in the collection is hand-painted prior to glazing, meaning there are subtle differences from plate to plate. In addition to its tabletop collection, Norm Architects has designed a cohesive bath collection for Menu, available in matte black and glossy white. Each item in the collection echoes the cylindrical shape of the previous item in the collection, offering a consistency and simplicity that will suit any modern bathroom. The collection of products can be used to complement a black and white bathroom, or to provide contrast to more colorful or patterned spaces. Each item in the bath series is designed for use as a cohesive collection, but can also be used individually. 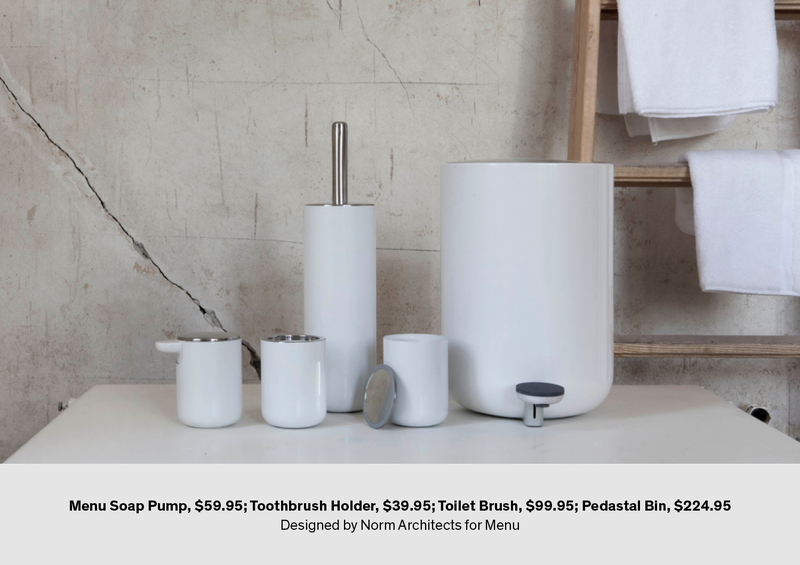 The collection of products is rounded out by the simple, angular toilet roll holder and towel bar, which juxtapose nicely with the cylinder shapes in the rest of the collection. 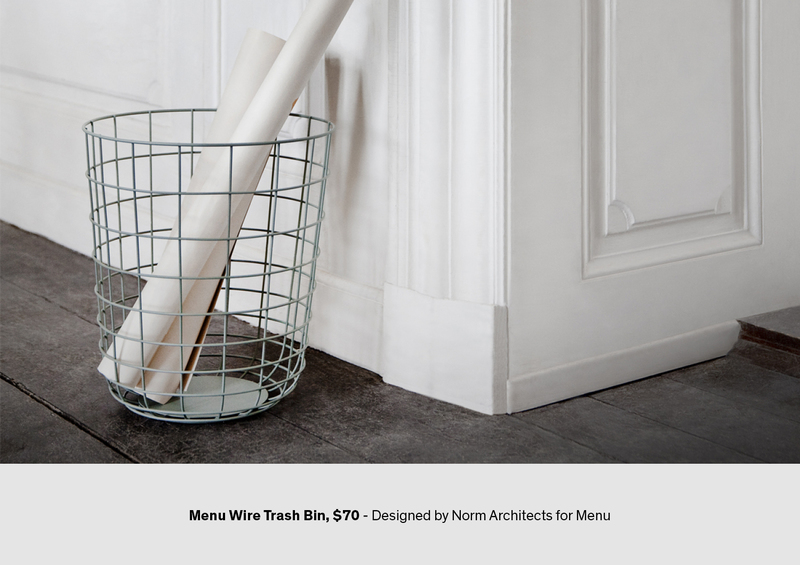 Norm Architects’ assortment of products for Menu also includes a streamlined coatrack, steel clocks, wire baskets, lanterns, and fire baskets. 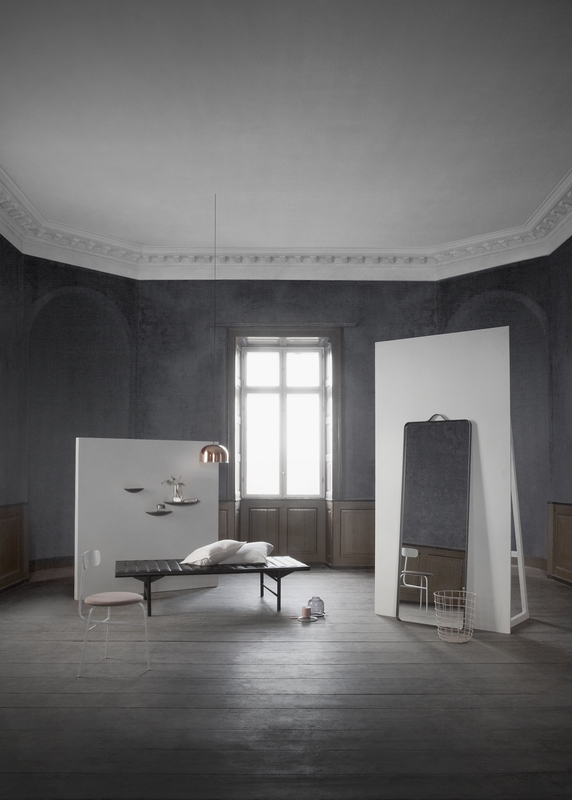 In addition to designing its own collection of items, the design directors also curate products from other designers and design firms, creating a varied assortment of products that are united by their clean design, functionality, and Nordic roots. Each product from Menu can be used on its own, or with other items throughout the brand’s assortment. The result is a versatile line of products that complements modern living, focusing on everyday function and style. Norm Architects strives to make designs that are refined and simple, seeking the simplest shapes without neglecting the aesthetic appeal of the shape and its design details. The goal is reaching a point where there is nothing to add and nothing to take away from the product to make It better. Bjerre-Poulsen and Rønn take pride in their culture and history, and strive to create new norms for the Nordic design tradition. Explore more of Menu’s celebrated designs, including its 2004 launch of Grethe Meyer’s GM Pendant Lights here.